Preheat oven to 350 degrees. Prepare 13 x 9 baking dish by spraying it with cooking spray. Cook pasta according to package directions and set aside. In a large nonstick skillet over medium heat, combine milk and Cheeseball Mix until well combined. Add turkey and bring to a boil. Reduce heat and simmer uncovered for 10 minutes. Remove from heat and stir in mexicorn. Add pasta to the meat mixture and mix well. Place half of the mixture in your baking dish and top with monterey jack cheese. Place the rest of the mixture on top of the monterey jack cheese. Bake covered for 25 minutes. Uncover and top with cheddar cheese and sprinkle with Topping packet. Return to oven until cheese is melted. Serve warm! - Serve with cilantro, avocado and sour cream! At Yoder's, we carry All Natural, non-injected Fresh Turkeys. We get several large shipments a couple of weeks before Thanksgiving and we flash freeze them to preserve all the natural goodness. This means your turkey will be partially frozen when you pick it up. 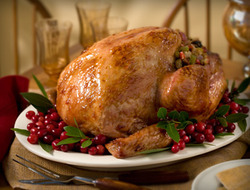 Allow 1 day of thawing, in the refrigerator, for each 4 pounds of turkey. Once thawed, a turkey may remain in the refrigerator for 4 days before cooking. Use the roasting chart as a guide; it doesn't necessarily determine doneness. The best test for doneness is the temperature of the meat. A turkey is done when the thigh meat reaches an internal temperature of 170 degrees. Insert an oven-safe meat thermometer into the thigh area, making sure the thermometer is not touching the bone. Roast the turkey at 350 degrees. We take some of these same All Natural Turkeys and smoke them in our smokehouses using hickory wood chips to give them incredible flavor. These Smoked Turkeys are a personal family favorite and once you've had one, you are unlikely to go back to the non-smoked ones! Let the turkey sit for around 10 minutes before carving. This allows the juices to soak up and settle instead of letting them seep out. So, how much turkey do you need? On average, plan for 3/4-1 pound per person. 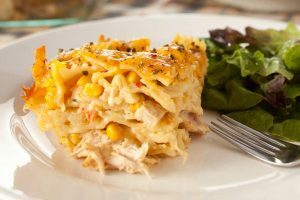 This will ensure you don't run out and maybe leave some to try out those yummy leftover turkey recipes you've seen! Dip four tilapia fillets in beaten egg whites and then coat with a panko bread crumb and grated parmesan mixture. Place fillets in pan, cover with foil and bake for 25-30 minutes or until the fish flakes easily with a fork. Pair with our Brown and Wild Rice Pilaf and some veggies for an easy meal! All items mentioned can be found in our store! You can also fry the fish if you prefer a crispier coating. Recipe is very similar to what I get when I eat at Red Lobster.